Kolbe Cathedral's Brianna Meekins (24) goes to the basket as Notre Dame of Fairfield's Laryssa Guimaraes (50) defends during girls basketball action in Fairfield, Conn., on Wednesday Feb. 6, 2019. Notre Dame 56, Kolbe 49. “I feel like we stole it,” ND coach Eric DeMarco said. To set the record straight, nothing illegal happened Wednesday. The Lancers (17-1, 11-0 SWC) took control of the SWC Patriot Division for a host of reasons. 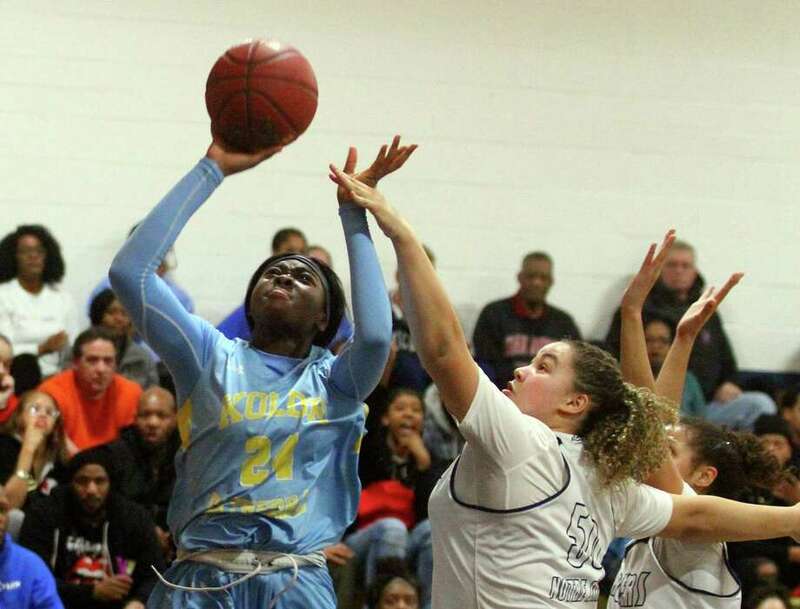 McCollough was spectacular in the second half, outdueling Kolbe forward Brianna Meekins, who led the Cougars (16-2, 9-2) with 19 points and seven rebounds. But there were other factors that might explain the dramatic turnaround. Notre Dame, No. 3 in the GameTimeCT poll, also got hot, making 7 of 10 shots in the fourth quarter after a 6 for 32 effort in the first half. And the Lancers kept the physical pressure up, forcing 26 turnovers. ND committed just 12 turnovers and only one in the final 11 minutes when the game did a 180-degree turn. Notre Dame outscored Kolbe 37-14 in those final 11 minutes and 23-7 in the final seven minutes. The Lancers, despite being a guard oriented team, were only outrebounded 32-31, and that’s with starting center Laryssa Guimaraes getting into early foul trouble. Backup Brianna Perez rescued the Lancers big minutes off the bench. With No. 9 Kolbe leading 42-33 early in the fourth quarter, the Lancers went on a 12-1 run led by McCollough and Ciara Brown (13 points, seven rebounds) to take a 45-43 lead. Notre Dame was 7 for 7 from the free throw line in the final four minutes to secure the victory. Gracen Kerr had 16 points for Kolbe while Cougar center Shaniya Stancil had eight rebounds and Mishell Pringle had six. ND’s Yamani McCollough won the head-to-head duel with Kolbe’s Brianna Meekins, scoring 19 of her 22 points after halftime while Meekins had 16 of her 19 in the final 16 minutes. “We’re a transition team and (Kolbe) took that away from us.” — Notre Dame coach Eric DeMarco, referring to the struggles his team had in the half-court offense, missing 31 of its first 37 shots from the field. Halftime: KC 22-14. 3-pointers: KC — Kerr 3. ND — McCollough 3, Mayo.